Suleiman is now one of the consistent frontrunners in international racing in Junior. Fast, with a strong sense of attack and physically fit, he deserved recognition for his outstanding performances in 2018. Wearing the colours of Morocco, he finished 7th in the FIA ​​Karting Academy Trophy after being on the podium of the Lonato Final in mid-season. In the flagship event of the year, he took 9th position in the FIA ​​Karting Junior World Championship held in Sweden on the Kristianstad circuit. His 2018 victories also included a good win in the Italian OK-Junior Championship. "Racing is never easy, but the 2018 season was very rewarding for me," said Suleiman. "Overall, I made an important step by winning several times and doing well in the top 10. I developed my 2019 programme by learning from last season. 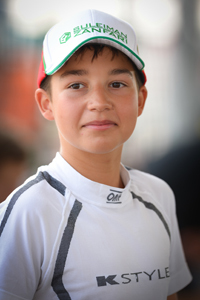 I will focus on the FIA ​​Karting Championships and DKM OK-Junior to give me every chance of success." The Junior European Championship and World Championship constitute the main goals of Suleiman's 2019 calendar. The young Moroccan will compete in the five FIA ​​Karting competitions with the Belgian team VDK Racing, World Champion in the category in 2016 and 2018. The Verdasdonk brothers’ team will use Kosmic chassis with IAME engine which they have implemented perfectly, as well as proposing a technical framework favourable to Suleiman’s progress. He will complete his programme in Germany with the five events of the DKM, the most interesting of the National Championships which attracts more and more international competitors. Suleiman will be part of Ralf Schumacher's Team RS Kart and will be driving an RS / IAME package with performances already noticed at the end of 2018. The first race of 2019 for Suleiman will take place at the Winter Cup on the famous Lonato circuit that he particularly enjoys, to enable him to make his mark with VDK Racing before the start of the European Championship at Angerville (FRA) at the end of April.